We knew tablets were coming this year at CES and ASUS – the makers of dinky little netbook the Eee PC – have been quick off the mark in getting their tablets out. Smallest is the handheld 7″ Eee Pad MeMo, the Eee Slider and Eee Transformer are both 10.1″ and stand out for incorporating QWERTY keyboards like a netbook. 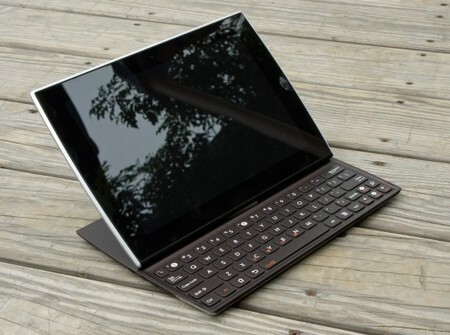 The large 12″ Eee Slate comes with a stylus and can have a keyboard attached. We really like the sound of this. Moving up the size spectrum is the Eee Pad Slider and Eee Pad Transformer at 10.1 inches which both pack NVIDIA chips and also run Android Honeycomb. They have a Windows 7 device too.. a large 12″ inch touchscreen tablet with an Intel i5 processor inside – the sort of chip you’d find in a laptop. This is a bit of a powerhouse tablet, Asus claim that the Eee Slate EP121 is “the most powerful tablet ever introduced” and promise that it allows the user to run a variety of desktop applications on its 64GB SSD drive while offering various data input options ranging from a Wacom Digitizer pen to an included Bluetooth wireless keyboard for ultimate user flexibility. Jonney Shih, CEO of the Japanese company announced they had picked up eight CES Innovation Awards. browse through some snaps of the tablets below..